Ultrasonic repellent devices used to keep away insects, rodents, birds, and even large animals have been around for quite a while, but their effectiveness depends on who you ask. Some critters just don’t seem affected, while some others definitely will avoid being around such a device. Deploying a few of these devices to scare off animals seems to be working quite well for [Ondřej Petrlík]. Around where he lives, the fields of tall grass need to be mowed down during the spring. Unfortunately, the tall grass is ideal for young, newborn animals to stay hidden and safe. The mowing machines would often cripple and hurt such animals, and [Ondřej] desperately wanted to solve the problem and prevent these mishaps. He built an electronic repeller to keep away wild animals and their young from his farm/ranch/range back in the Czech Republic. 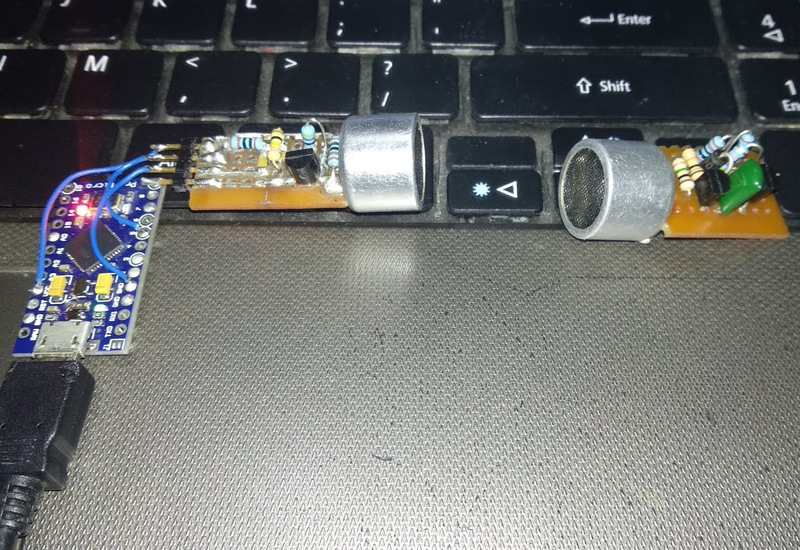 He used an Arduino Mini to drive a large piezo transducer to scare away the wild animals from the vicinity of the device. He likely used a high enough frequency beyond human range, but we’ll know more when he publishes his code and details. There are also a few large 10mm LED’s – either to visually locate the device or help drive the animals away in conjunction with the ultrasound, with an LDR that activates the LEDs at night. Using the Arduino helps to turn on the transducer at random intervals, and hopefully, he is using a range of different frequencies so the animals don’t become immune to the device. His first prototype was cobbled together using vanilla, off the shelf parts. An Arduino, a step up converter, an LDR, a couple of LEDs, a reed switch for powering it on via a magnet, and a large ultrasonic transducer, all powered by three alkaline AA batteries. He stuffed it all inside a weatherproof molded enclosure, holding it all together with a lot of hot glue. This didn’t make it very rugged for the long-term, outdoor field use. While the prototype worked well, he needed several of the devices to be placed all around his farm. To make assembly easy and make it more reliable, he designed a custom PCB to fit in the weather proof enclosure. This allowed him to easily mount all the required parts for a more reliable result. His project is still a work in progress, so if you have worked with these types of ultrasonic repellent devices to keep away animals, and have any insights that may help him, do chime in with your comments. [Ondřej] seems pretty satisfied with the results so far. You’d be hard pressed to find a public restroom that wasn’t packed full of hands free technology these days. From the toilets to the sinks and paper towel dispensers, hands free tech is everywhere in modern public restrooms. The idea is to cut down on the spread of germs. However, as we all know too well, this technology is not perfect. We’ve all gone from sink to sink in search of one that actually worked. Most of us have waved our hands wildly in the air to get a paper towel dispenser to dispense, creating new kung-fu moves in the process. IR simply has its limitations. What if there was a better way? Check out [Ackerley] and [Lydia’s] work on gesture recognition using ultrasound. Such technology is cheap and could easily be implemented in countless applications where hands free control of our world is desired. Indeed, the free market has already been developing this technology for use in smart phones and tablets. Where a video camera will use upwards of 1 watt of power to record video, an ultrasound device will use only micro watts. IR can still be used to detect gestures, as in this gesture based security lock, but lacks the resolution that can be obtained by ultrasound. So let us delve deep into the details of [Ackerley] and [Lydia’s] ultrasound version of a gesture recognizer, so that we might understand just how it all works, and you too can implement your own ultrasound gesture recognition system. [Mike] saw a few videos of ultrasonic acoustic levitation rigs put together by student researchers. Figuring it couldn’t be that hard to replicate, he set out and built his own using surplus parts and whatever was sitting around his parts drawer. The build began with a huge ultrasonic transducer from an old ultrasonic cleaning tank [Mike] picked up on eBay for $20 £20. He didn’t pick up the standard driver board, as those don’t have a very clean output – something desperately needed if you’re setting up a standing wave. He did manage to put a simple supply together with a 555 timer, a MOSFET and a 12 V transformer connected backwards, though. The test rig is pretty simple – just the transducer sitting on a table with an aluminum plate sitting above it on threaded rods. By adjusting the distance between the transducer to the aluminum plate, [Mike] managed to set up some standing waves he was able to suspend small Styrofoam balls in. It’s not quite precise enough to levitate small chunks of sodium and water, but it makes for an excellent science fair-type project.